A rhumb line is the path that a ship follows if its heading remains unchanged. The great circle route is the shortest path between any two points on a globe. When following a great circle path, a ship must make several heading changes to stay close to the track. From detailed data that we studied from several Olympic voyages, it appears that course segments (in true degrees) would be laid down at Local Apparent Noon (LAN) each day. However, it also seems that very small course adjustments took place as often as every six hours. Whenever possible, being on a great circle path is desired, since it minimizes the overall length of a passage. Olympic departed New York on June 28, 1911 for her eastbound maiden voyage back to Southampton, with two stops along the way. After leaving New York, Olympic crossed the Atlantic to discharge passengers and mails at Plymouth, England on July 4, 1911. From Plymouth she went on to Cherbourg to discharge more passengers and mails, and then on to her home port of Southampton, the final port of call. The official passage across the Atlantic eastbound began by taking departure off the Ambrose Channel Light Vessel outside of New York Harbor on June 28, 1911 at 5:06 p.m. NYT. From Ambrose, she headed for a turning point near 40° N, 70° W, and from there followed a rhumb line course to 41° N, 47° W, the corner point for eastbound steamers at that time of the year. From the corner, Olympic followed the great circle route across the Atlantic to a point south of Bishop Rock Light, a small lighthouse located off the westernmost tip of the Isles of Scilly. From Bishop Rock she went due east to about the longitude of Lizard Point Light, and then on to Eddystone Light, a lighthouse located on a group of rocks some fourteen miles out from the Plymouth breakwater. The arrival of the Olympic off Eddystone Light on July 4, 1911 at 4:36 p.m. GMT marked the official endpoint of the eastbound transatlantic crossing. A chart of these westbound and eastbound routes for this relatively new White Star Line service is shown below. These routes, known as the southern tracks, were used by steamers from January 15 through August 23 to avoid running into ice. From August 24 to January 14, steamers followed more northerly tracks, thus shortening the transatlantic distance by about 110 miles.2The southern tracks shown below are also the same routes that Titanic was to follow when she entered service in April 1912. Olympic’s maiden voyage details for her first Atlantic crossing appeared on her log card, which gave the departure time and date, the arrival time and date, the latitude and longitude of the ship at Local Apparent Noon for each day, the distance run for each day, the total distance run from departure point to arrival point, the total passage time in days, hours, and minutes, and the average speed for the crossing in knots taken to two decimal places. It also included remarks about the weather and sea conditions, listed the voyage number and direction, the departure and arrival points for the transatlantic part of the voyage, and all the ports visited for the voyage. A scan of her maiden voyage log card, courtesy of Günter Bäbler, is shown below. 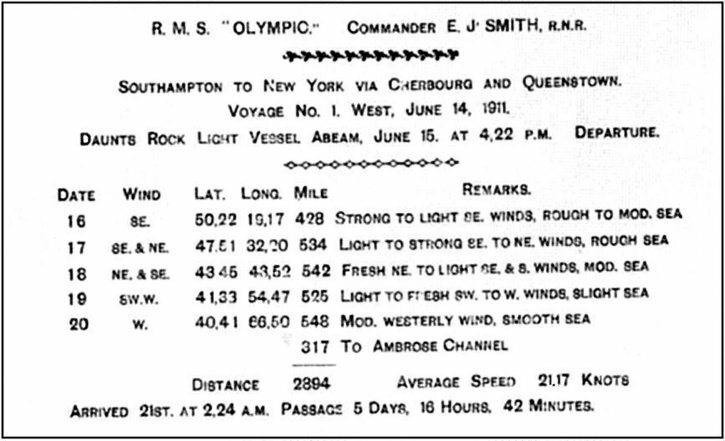 As soon as those in charge of Olympic spoke to reporters and the ship’s passengers carried away their souvenir log cards for “Voyage 1, Westbound,” the impressive statistics of her maiden voyage were known. She had completed the 2,894-mile crossing from Daunt’s Rock to Ambrose in only 5 days, 16 hours and 42 minutes, which added up to a swift 21.17 knots. These statistics were printed on the log card, and widely distributed in the newspapers of the day. Bruce Ismay was ecstatic at the new liner’s performance and cabled the time back to Liverpool. These statistics have been repeated unquestioningly since. However, upon a close examination some discrepancies become apparent. Olympic’s arrival time at the Ambrose Light Vessel was reported as 2:24 a.m. on Wednesday, June 21, 1911, which appears confirmed by the fact that she was at Quarantine shortly afterwards. However, while this authoritative time was printed on the log card, the departure time from Queenstown (or rather Daunt’s Rock) was printed as 4:22 p.m. on Thursday, June 15, 1911. Captain Smith also used the time in a telegram which was transmitted during the maiden voyage, reporting his ship’s progress. The problem arises when the passage time of 5 days, 16 hours and 42 minutes is taken into account. Counting back from the 2:24 a.m. arrival time, Olympic’s departure on Thursday appears to have been 2:42 p.m. instead of 4:22 p.m. in order for everything to fit. Those researchers aware of the conflict would have considered the likeliest explanation to be a reversal of the first two digits of the printed time, to make it read “4:22” instead of the correct “2:42.” However, there is strong evidence that the 4:22 p.m. departure time was correct, and that there was no such mistake. She had averaged more than twenty-two knots during a part of the voyage, and we started from Queenstown fully three hours late. The Olympic can be depended on to be a Wednesday morning ship, just as she was designed for. To be sure, there was no severe weather to try her out, for the passage was an ordinary June run. But we have power enough to take care of emergencies. In the engine rooms, Chief Engineer John [sic] Bell and Engineer John Fleming both report that everything went without a hitch. Smith’s words would appear to be the definitive answer. Who better than Olympic’s commander to answer the question as to her departure time? There would seem to be no logical explanation for Smith saying that the Olympic had been late unless he was mistaken or unless she had indeed been late in departing Queenstown. Up to this hour the Olympic has exceeded the speed promised by her builders, her average from noon Saturday to noon Sunday being 21.89 knots. Since passing Daunt’s Rock at 4:22 P. M. Thursday she has done the following: To noon Friday, 458 [sic] knots; to noon Saturday, 524 knots; to noon Sunday 542 knots. Weather fine. Present weather outlook less favorable. At this writing all going smoothly. The Olympic was reported 433 miles east of the Ambrose Channel Light Vessel at 6:58 o’clock yesterday morning. Her commander, Capt. E. J. Smith, commodore of the White Star Line, wirelessed to the liner [sic] soon afterward that he expected to reach Quarantine about 3 o’clock this morning. Assuming that report was accurate, and assuming the time given in Olympic’s wireless message was Apparent Time Ship (ATS), also known as ship’s time, then that puts Olympic 433 nautical miles east of Ambrose at 6:26 a.m. NYT on Tuesday morning. How would we know this? As seen in the data on her log card, Olympic was at 66° 50’ W longitude at local apparent noon on Tuesday, June 20. For that location and date it turns out that Olympic’s time was 32 minutes ahead of New York Time. Therefore, to get to New York Time, we have to subtract 32 minutes from 6:58 which gets us to 6:26 a.m. NYT for that position report. Assuming the ship would maintain about 22 knots average speed over ground, it would take Olympic 19 hours and 41 minutes to cover those 433 nautical miles. That gives us an expected arrival time off Ambrose at 2:06 a.m. Wednesday morning. So, it appears that the actual recorded arrival time at Ambrose, 2:24 a.m., is also correct. Since it appears that both the departure time and the arrival time on Olympic’s log card are correct, the only possibility is that there was an error made when some junior officer worked out the total passage time for her westbound crossing – an error never corrected until now. How can such an error happen? The answer can only be speculated but, to get the total passage time, several conversions must be made, such as days into hours and hours into minutes. Allowance must also be given for a five-hour difference between GMT, the time used by White Star Line ships when in English and Irish waters, and the time for the 75th meridian, used when passing arrival points to the east coast of the United States and Canada.3The most probable error appears to have occurred during a subtraction process while working out the crossing time. Once the conversion was made to a common time reference, such as GMT, the time of the passage can easily be derived by subtracting the arrival time from the departure time. The resulting time difference is then converted into days, hours and minutes for the passage. By expressing the same time difference in total hours, one can get the average crossing speed by dividing passage time into the total crossing mileage. The passage time is just the difference between 9,084 minutes and 982 minutes. This works out to 8,102 minutes, or 135.033 hours. This is precisely the same as 5 days, 15 hours and 2 minutes, the correct crossing time for the passage. Also, 135.033 hours divided into the crossing distance of 2894 nautical miles gives an average crossing speed of 21.43 knots, the correct average speed for the transatlantic crossing. Now suppose, in subtracting 982 minutes from 9,084 minutes, that an error of 100 minutes crept into the process, giving a passage time of 8,202 minutes instead of 8,102 minutes. Converting 8,202 minutes into days, hours, and minutes gives 5 days, 16 hours, and 42 minutes, the value on the log card. Also, 8,202 minutes is the same as 136.700 hours. Dividing that into the crossing distance of 2894 miles gives an average speed of 21.17 knots, the value on the log card. As we have shown, the correct difference in time from departure at 4:22 p.m. GMT on June 15 off the Daunt’s Rock Light Vessel to 2:24 a.m. NYT on June 21 off the Ambrose Channel Light Vessel really works out to 5 days, 15 hours, and 2 minutes, and the average speed works out to 21.43 knots. At the end of the voyage, Bruce Ismay was greatly pleased with Olympic and her performance, as well as the satisfaction she had given to her passengers. Little did he suspect that there was an error in the crossing time that understated her performance. The ghost of Bruce Ismay, if there be one, must surely be smiling now. The ship did much better than what anyone was told. Based on the location data reported in the Olympic’s log, we can also derive several other interesting facts and statistics regarding her westbound maiden voyage, like the amount the clocks went back each night and the average speed for each day’s run.
. . . It is necessary to put the clock back every 24 hours. The alteration in time is made at about midnight, and the clock is usually put back from 35 to 45 minutes on each occasion, the exact amount of time depending upon the distance the ship is estimated to make by noon the next day. During the first 24 hours, however, owing to the change from mean time to apparent time, the alteration is likely to be considerably more than 45 minutes, especially while summer time is in use. Once again, there appears to be a slight error in the data. The total mileage for the eastbound crossing was 3,081 miles. The total time of passage is given as 5 days, 18 hours and 30 minutes. This time, there was no mistake in the passage time calculation. Nor was there a mistake in the crossing distance, which matches closely with other eastbound crossings over the same route of travel. So, it appears that an arithmetic error was made when the average crossing speed was calculated. The correct average crossing speed works out to 22.25 knots, not 22.30 knots as appears to be written on the log card.8In this case, Olympic’s average crossing speed was overstated. RMS Titanic left Queenstown on her maiden voyage crossing on April 11, 1912, passing Daunt’s Rock Light Vessel at 2:20 p.m. GMT. She then proceeded at 70 revolutions per minute along a path that hugged the same southern coast of Ireland toward Fastnet light as did her famous sister the year before. As we all know, Titanic never completed her maiden voyage. On the night of April 14, she struck an iceberg at 11:40 p.m. ATS, and sank just 2 hours and 40 minutes later. But we do know some facts about Titanic’s maiden voyage that allow us to make some comparisons. There was a clock setback of 47 minutes planned for the night of April 14 that was not done because of the accident.10The collision coordinates in the above table were based on the location of the Titanic wreck site after allowance was made for a surface current of 1.2 knots at 197° true based on the location of the wreckage observed Monday morning and the location of the wreck site.11The calculated distance from Local Apparent Noon on April 14 to the collision point, 258 miles, was based on the known route of travel between those two points. It should be mentioned that this derived distance agrees very well with the log reading taken by quartermaster George Rowe when Titanic collided with the iceberg at 11:40 p.m. Rowe testified the ship struck at 20 minutes to twelve by his watch and, when he then looked at the patent log, it showed a run of 260 miles through the water since noon.12That makes for an average speed of 22.28 knots through the water. The average speed made good over ground that we show, 22.11 knots, is simply obtained by dividing 258 nautical miles, the distance run over ground, by 11 hours and 40 minutes, the time from noon to the collision. As we shall soon see, the position and times of the Titanic along the route of travel of her maiden voyage were not too different from the positions and times of the Olympic for her second transatlantic crossing. There are some in the Titanic community who are claiming that the real collision time was 12 hours and 4 minutes past noon instead of 11 hours and 40 minutes. If that were the case, the average speed over ground would calculate out to 21.38 knots instead of the 22.11 knots that we show. That is a drop of nearly ¾ of a knot from what was averaged over the previous 24 hours and 45 minutes. This is clearly at variance with all known evidence regarding the increase in revolutions that was occurring during the course of the voyage, and the independent observations of several passengers of increased engine vibrations noticed that Sunday night.13It also does not hold up when viewed against the supporting evidence provided by quartermaster Robert Hichens that the ship was observed doing about 22.5 knots through the water during the hours from 8 p.m. to 10 p.m. as measured by the ship’s log,14a two-hour average that is consistent with the results obtained from Rowe’s observation and with the apparent increase in revolutions noticed by several passengers.15The difference between the speed of the ship through the water and a ground speed of 21.38 knots that comes from using a longer time interval is simply inconsistent with what the ship was actually doing that night. Nor can it be explained by the ship traveling over a longer path because of an alleged delay in turning the corner, something that came about in an attempt to explain how the ship managed to reach a collision point some 13 miles west of the now-known wreck site.16Nor does a collision time of 12:04 a.m. hold up when one carefully looks at the reported time of that event as observed by many passengers and crew members alike. From a purely navigational sense, such theories simply do not stand up under careful analysis. In looking at the positional and time data for Titanic’s maiden voyage, it will be noticed that on April 14, Titanic’s clocks were 2 hours 58 minutes behind GMT, or 2 hours and 2 minutes ahead of NYT. This was based on her expected longitude at Local Apparent Noon when the clocks are adjusted the night before and then corrected slightly if necessary in the forenoon. Those readers familiar with the two inquiries into Titanic’s loss may notice a discrepancy between this result and the times in the final reports of those inquiries. The conclusion of the American Inquiry had Titanic time as 1 hour 33 minutes ahead of NYT. The British Inquiry had Titanic time as 1 hour 50 minutes ahead of NYT. At the limitation of liability hearings in New York in 1913, the time given by the White Star Line in response to a question asked by the interrogatories had Titanic time as 1 hour 39 minutes ahead of NYT. It is far beyond the scope of this article to go into all the details relating to why there has not been a consistent answer to this fundamental question of relating apparent time ship to Greenwich Mean Time or New York time. The process of how time on White Star Line ships was adjusted was explained quite clearly in testimony given by Titanic’s second officer Lightoller and third officer Pitman. Yet, it almost seems as if some people may have deliberately withheld critical information to make solving the question of time a difficult, if not almost impossible task. When tracing back the origins of the numbers that came out in the inquiries and hearings, we find that the American Inquiry settled on a difference of 1 hour 33 minutes, apparently from the testimony of Titanic’s fourth officer Boxhall, a number that had also worked its way into a wireless message sent Monday evening from Captain Rostron on the Carpathia to Captain Haddock on the Olympic, a message which included the incorrect foundering coordinates that came from Boxhall. The British Inquiry settled on a difference of 1 hour 50 minutes from NYT, apparently by equating Titanic time to time on the SS Californian. And at the limitations of liability hearings, a difference of 1 hour 39 minutes was offered up by the White Star Line by simply adjusting ship’s time to the longitude of 50° 14’ W that was sent out in what we now know to be an erroneous distress position. The question of time will be addressed much more fully in a separate paper dealing specifically with that particular long-standing issue. After her noted arrival abeam of Ambrose Channel Light Vessel in the early morning hours of Wednesday, June 21, 1911, Olympic proceeded on to her Quarantine station off Staten Island. She left Quarantine at 7:45 a.m., and was saluted on her way up New York Harbor by all kinds of craft as she steamed to Pier 59 in the North River. With the assistance of twelve tugs, Olympic was safely moored at 10 a.m. after taking the better part of an hour, as there was a delay in getting the ship far enough in to allow her gangways to be opened. Yet, despite Captain Smith’s remark that there would be no attempt to bring her in on Tuesday, he did precisely that on Olympic’s second transatlantic crossing westbound. On Wednesday, July 19, 1911, The New York Times headlined, “OLYMPIC CUTS HER OWN TIME,” 5 days, 13 hours, 20 minutes from Daunt’s Rock to the [Ambrose] Lightship. As before, we can easily derive additional statistics from the data on the log abstract, such as clock adjustments and average speed over ground for each day’s run. These are all given in the table below. There are those who believe that it was never intended for these ships to make any arrivals before Wednesday. That is not true. Looking at the progress the Titanic made until the time of the accident, it is quite clear that she was averaging as well as her famous sister did over her entire maiden voyage – and the Titanic had completed only 62% of her crossing. It is quite clear that Titanic under all average speeds considered would have beaten Olympic’s maiden voyage performance. If she would have maintained an average speed of 21.6 knots or greater, she would have been abeam of Ambrose some time on Tuesday night. Notice that the results for the passage time have nothing to do with the time that a voyage begins. It has to do with distance traveled and speed made good over ground. The following chart shows the noontime positions for the first and third eastbound voyages of the Olympic that were available to us. The Olympic positions for voyages 1 and 3 are identified as “O1” and “O3,” respectively. On a Mercator projection chart, rhumb line tracks appear as straight lines while great circle tracks are curved. After the Titanic disaster, the southern tracks were shifted farther southward. Note: 16 hours, 22 minutes = 16 x 60 + 22 = 982 minutes. To convert NYT to GMT, add 5 hours. Note: 6 days, 7 hours, 24 minutes = 6 x 24 X 60 + 7 x 60 + 24 = 9,084 minutes. 5 days, 18 hours, 30 minutes is the same as 138.5 hours. Dividing this into 3,081 nautical miles gives 22.25 knots. Samuel Halpern, Keeping Track of a Maiden Voyage, Irish Titanic Historical Society’s White Star Journal, Vol. 14, No. 2, August 2006, pp. 9-14. This is consistent with results obtained in the Marine Accident Investigation Branch (MAIB) Reappraisal of Evidence Relating to the SS Californian in 1992. American Inquiry, p. 519 and p. 523, and British Inquiry questions 17608-17630. These include documented observations from Mr. Lawrence Beesley, Mr. C. E. Henry Stengel, Mrs. Mahala D. Douglas and Mr. George Rheims. It was also mentioned that two or three additional double-ended boilers were lit up that Sunday morning (fireman Frederick Barrett) and put on line that Sunday evening at 7:00 p.m. (fireman Alfred Shiers). This suggests an increase from 75-76 revolutions per minute to about 78 revolutions per minute during the last few hours before the accident. Samuel Halpern, A Minute of Time, Titanic Historical Society’s Titanic Commutator, Volume 29, Numbers 171 and 172, pp. 150-157 and 208-219. The New York Times, July 19, 1911. George Behe, Titanic – Safety, Speed and Sacrifice, Transportation Trails, 1997; and J. Kent Layton, The Arrival That Never Took Place, Titanic International Society’s Voyage 54, Winter 2005, p. 56. Mark Chirnside, Appendix Eleven: “Short of Coal?”, The Olympic-Class Ships – Olympic, Titanic, Britannic, Tempus Publishing, 2004. Mark Chirnside is a well known researcher and author in the Titanic community. To his credit he has written several books dealing with such ships as the RMS Olympic, RMS Majestic, and RMS Aquitania, as well as a book dealing with the three 'Olympic' class ships: Olympic, Titanic, and Britannic. He also has authored a number of articles on various related subjects. He maintains a website at www.markchirnside.co.uk. Sam Halpern has been involved with detailed Titanic related research for the past several years. He has authored a number of research articles for ET as well as published a number of articles that appeared in the Titanic Historical Society's Commutator, the Irish Titanic Historical Society's White Star Journal, and the Titanic International Society's Voyage. In addition, he has presented several technical papers at the Titanic Symposium in Toledo, OH last September, 2006. This article also appears in the latest edition of Voyage (#59), the journal of the Titanic International Society.